The following is a receipt slip acknowledging the donation of $100 to the Berry Schools. 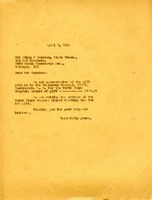 The donation was generously given by a Mrs. James Tolman Pyle. Mrs. Dave H. Morris donates $500.00 to the Berry Schools for covering current expenses. 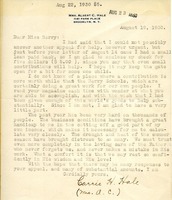 Carrie Hale writes to Martha Berry and has enclosed a check for $5.00. She is helping the Berry Schools and mentions how she wishes she could contribute more. She then goes on to talk about the economy at that time. 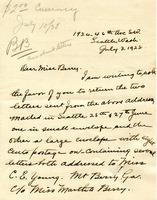 Amy Young requests the return of two letters which were sent to her sister, Charlotte E. Young, in the care of Martha Berry. 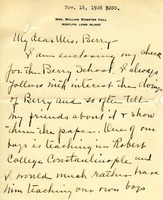 Those letters were sent in anticipation of Charlotte's visit to Mount Berry, but that visit did not occur. 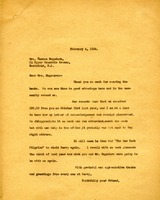 Amy's letter also contained the gift of $2. Miss Talmage sends a $20.00 check to the Berry Schools to be used towards the new dormitory or for the general work of the schools. Mrs. Cash encloses a check and makes a proposal to help more in later times. 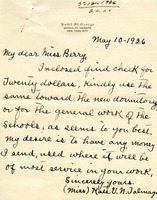 Mrs. Hall writes to Martha informing her of the check for 200 dollars for the Berry school. She also informs her about how she follows the Berry Schools with much interest and tells her friends about it by showing them the news in the paper. She also talks about her two sons. One is a minister at Christ's Church in New York and the other is teaching for two years at Robert College Constantinople. 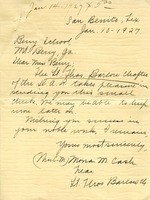 This is letter to Alice G. Gadsden from Martha Berry thanking Gadsden for the donation of $100.00 from the Daughters of the American Revolution.